This is the story of the stonemasons strike of 1841 which brought to a halt the building of Nelson’s Column and the rebuilding of the Houses of Parliament. Builders are not best known for their genteel turn of phrase, so when the foreman on one Victorian building site gave his stonemasons the colourful benefit of his views about their work, he can hardly have expected to find himself at the centre of a major industrial dispute. Unfortunately for him, the project was to rebuild Parliament following the fire that had devastated the medieval Palace of Westminster six years earlier, and the leader of the Friendly Society of Operative Stonemasons was spoiling for a fight. The result was an eight-month strike which brought work to a halt not just at Westminster but on other high-profile construction contracts awarded to the firm of Grissell and Peto – among them the Woolwich Dockyard and Nelson’s Column. 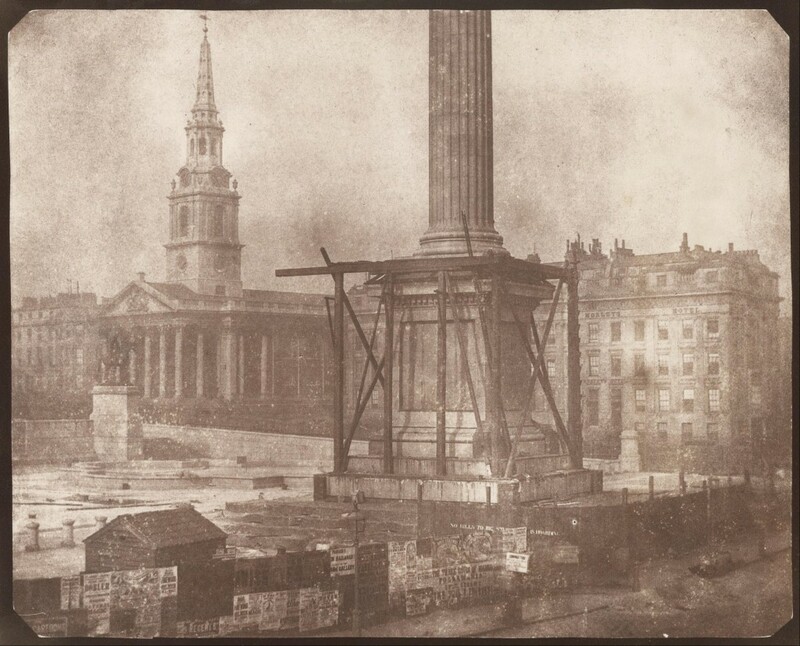 Nelson’s Column under construction in a famous photograph by William Henry Fox Talbot. The rebuilding of the Parliament buildings would take from 1835 until 1870 to complete. But this was not the first or last time that industrial disputes would hit major public works. In 1825, journeymen carpenters had stopped work at Buckingham Palace, closing down the site and enforcing their strike with such vigour that one attempt to prevent non-union men from working had to be broken up by a contingent of Coldstream Guards. A quarter of a century on, glaziers employed to fit the 49-inch by 10-inch pains of glass for the Crystal Palace in Hyde Park came out on strike complaining about the pace of work expected of them. But for the use of blackleg labour, the Great Exhibition would have been homeless. But of all the building trades, it was the stonemasons who were the best organised and the most militant in their approach to industrial relations. Masons have a long history of collective organisation. Strikes over pay and conditions are recorded as far back as 1750, and the first friendly societies for those working in the trade (trade unions in all but name) were already in existence by 1815. But it would not be until the repeal of the Combination Acts in 1824 made trade union activities less hazardous, that the Friendly Society of Operative Stonemasons of England and Wales came into existence. By 1838, when Thomas Shortt succeeded to the paid post of secretary, the society had nearly 5,000 members, about 60% of those eligible to join, and the stonemasons alone among the building trades could claim to have a financially sound and genuinely national organisation. Shortt would prove to be a deft union administrator – handling inter-union rivalries well, and ensuring that the society withdrew from Ireland, where organisation had proved terminally difficult. But, in the judgement of Raymond Postgate, who wrote an influential history of building trades unionism in the 1920s, he was “weak-willed and uncertain in all personal temptation” and the sort of man who was “easily disliked”. It might even be fair to say Shortt enjoyed a fight: the earliest mention of him in the society’s records notes that a fellow mason by the name of Henry Versus had “pulled Brother Shortt by the Nose, &c” out of a public house after being abused as a “viper” and a “black reptile”. So when in September 1841 stonemasons working on the new Parliament building declared the work “black” – that is, union members would not accept the work – Shortt was in his element. In the words of Postgate, “It was, in effect, a fight with the Government, and the very difficulty of the task spurred him on”. The strikers demanded the dismissal of a foreman by the name of Allen who, the society declared, was “a man who damns, blasts and curses at every turn”. He also organised public meetings with big name political speakers, among them the Radical MP Thomas Wakley and the Chartist leader Feargus O’Connor. He booked the Royal Victoria Theatre for a performance at which striking masons recited bad verse about their cause. Shortt successfully bled provincial lodges of the society of cash, and other unions were induced to form a committee to support the strike. In all, he raised a strike fund of nearly £5,000, without which the masons would have been swiftly starved back to work. Instead, the strike became a cause celebre, with much speculation about precisely what the foreman had said to so offend the delicate sensibilities of his workers. Newspaper cartoons made fun of the truncated column in Trafalgar Square, and for weeks at a time no progress was made at all in the building work. The few strikebreakers who did turn up allegedly did more damage than good. As the strike dragged on into 1842, however, even the hyperactive Shortt began to realise that the society stood no chance of a victory, and talks began to try to regain jobs for the men who had walked off the job the previous autumn. By May, all of these had got work, and the strike was officially called off. By this time, non-union men had been working on Nelson’s Column for some time, so in the words of Postgate, “the most famous monument to the British Empire is, suitably enough, built by scab labour”. The strike had all but bankrupted the stonemasons’ society. Membership had fallen to just over 2,000, and Shortt himself came under attack from his members. Despite asking for a pay rise to 38 shillings a week, he was offered and reluctantly accepted a reduction to just 30 shillings. Slowly the society began a recovery that would see it survive for a further 80 years until in 1921 it became one of the founding members of the Amalgamated Union of Building Trade Workers. Shortt’s end was less happy. The final ignominy came in June 1843, when a new national committee demanded to see the society’s books. At first he resisted, but eventually had no choice but to show them wanted they wanted. Shortt was found to have pilfered small but regular sums – a few shillings at a time amounting to not more than £4 during his time in office. He resigned and was not heard of in the trade union movement again.